Click thumbnail or post title to view a post. 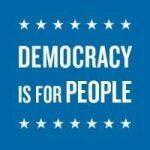 Click an ‘Issue’ (WV Supreme Court, Dark money, etc) to view a list of all posts tagged with that issue. What Do We Want? Democracy! When Do We Want It? Now! By George, Are you Abe-le to Help Us Promote the #WVProDemocracy Platform?